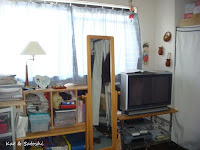 Do you change the layout of where you live? I think we've rearranged our apartment too many times to count. 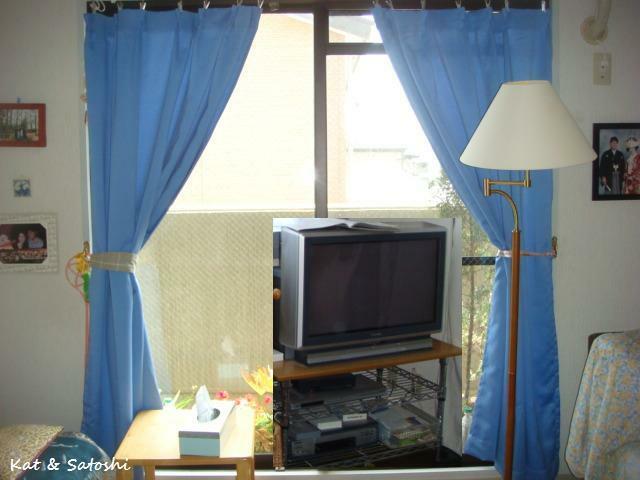 Before going to Hawaii in March, I had our television placed in front of our big glass doors (something like this photo). Only problem with this is that during the summer, we get lots of sun in this area. Not good for electrical stuff. 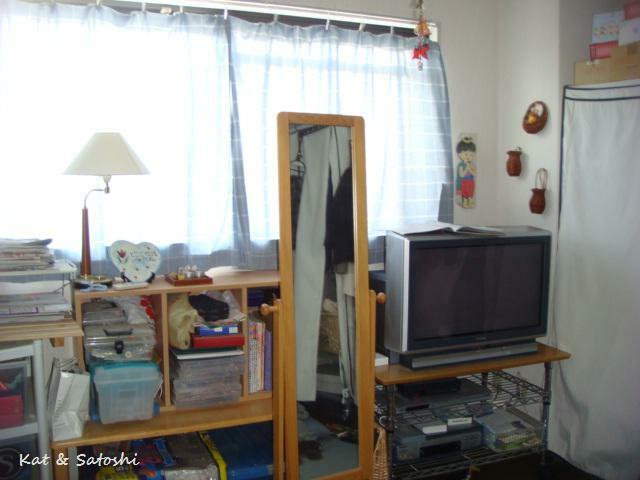 So, I told Satoshi we should move the television into our "closet room" because it is one of the only other areas with the cable plug for the television. Of course, he looks at me like I was out of my mind and says, "what will we do while we eat?" So, we've been trying this set up for the past couple of weeks. It is a good thing most of our furniture is on wheels so it is easy to move them when I get a crazy idea to change our layout. All in all, it is a good set-up. Now I don't have the television on as background noise while I'm on the computer. 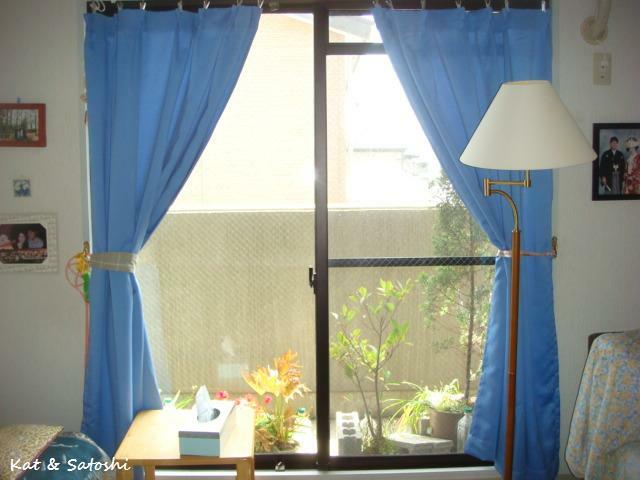 And if I sit in the area with the big glass doors, I listen to music, read or just have a little quiet time. Do you change the layout of where you live? I saw this recipe in "Whole Living" and wrote it down because I'd never had brandade and thought it was interesting and easy enough to try. As with anytime I scribble something down, I usually forget to write steps/ingredients down. So, here is the recipe online. As a result of my scribbling, I whizzed everything in my food processor instead of mashing or "whisking" as the recipe directs and the consistency came out smoother than the photo in the magazine. Still, this was delicious with some baguette. Sardine brandade serves 4 from "Whole Living April 2012"
NOTES: I couldn't find smoked sardines, so I just used sardines that were packed in olive oil. The recipe says to use the sardines and the oil they are packed in, but because I hadn't scribbled this part down, I didn't add the packing oil. Also, the recipe suggests boiling the garlic with the potato, but I instead roasted my garlic (oven 220C (425F) for 30 minutes). Aesthetically, it doesn't look good, but it was, I ate it right after making it, so it was still warm and it was delicious on toasted baguette. I liked the creaminess that came from the potatoes. The recipe calls for salt, but I didn't add any. I think this would be nice served warm in winter and served chilled for summer. Thursday, I got to spend the day with Kazumi. We went to Taikoen, along with Kazumi's neighbor, Mrs Takahashi and her sister-in-law, Eiko. I have actually visited Taikoen pre-blog with my host-mom for lunch. This huge and beautiful property (5.71 acres) is located in the midst of skyscrapers and condos, when you are on the property it feels like you are in another world because it is so quiet and there are many trees and plants. 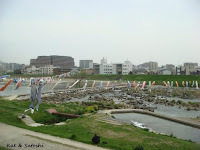 It is owned by the family of Denzaburo Fujita, a successful businessman. 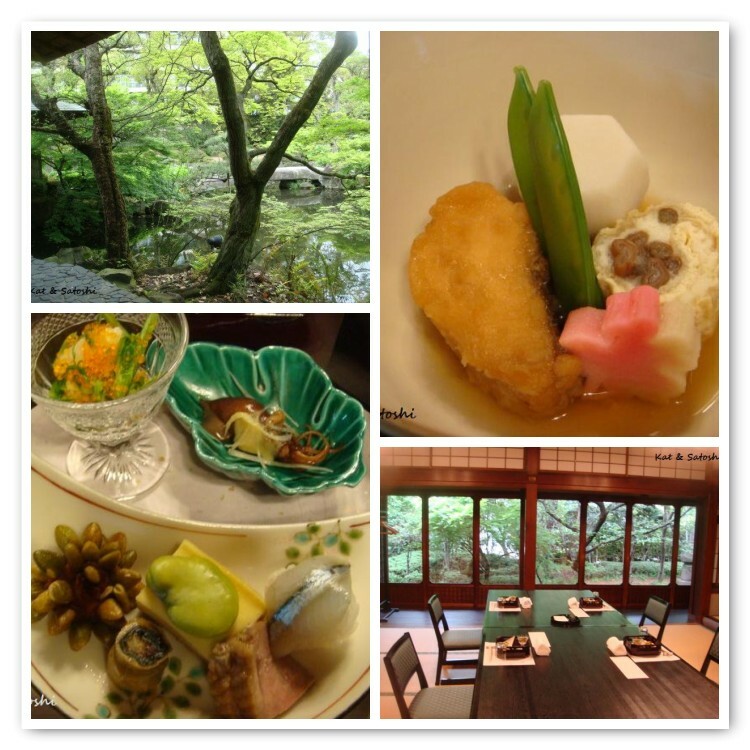 The property is now used for weddings, tea ceremonies, as well, as for special occasions. 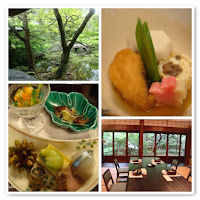 Lunch was a kaiseki meal at Yodogawa-tei, which was originally the residence of Denzaburo Fujita. Kaiseki is a multi-course meal that focuses on seasonal ingredients. There were many different items to try and everything was delicious. Then we went back across the street to Taikoen and had tea in their lounge. Eiko and I got "splashed" with a glass of water as the waitress was serving us and boy, let me tell you, they REALLY apologized. They brought out towels, and bowed profusely, the manager came out and presented his meishi (business card) and to make amends they treated us to some cake. All in all, it was a great day, thanks for inviting me Kazumi! 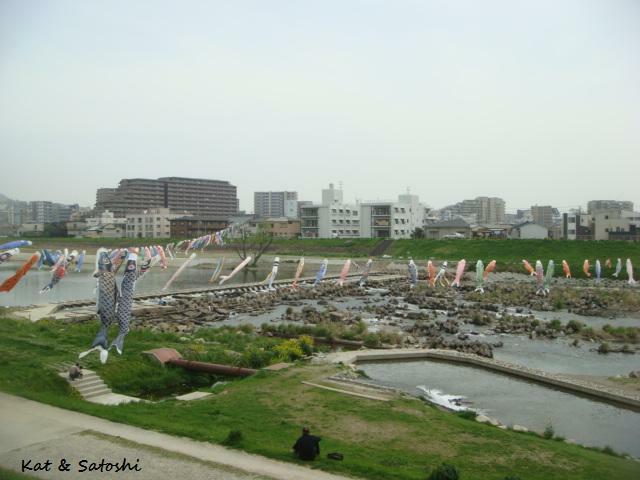 It had been a couple of years since I went to check out the koinobori in Ikeda. In that amount of time, they cleaned up the river and added more rocks. 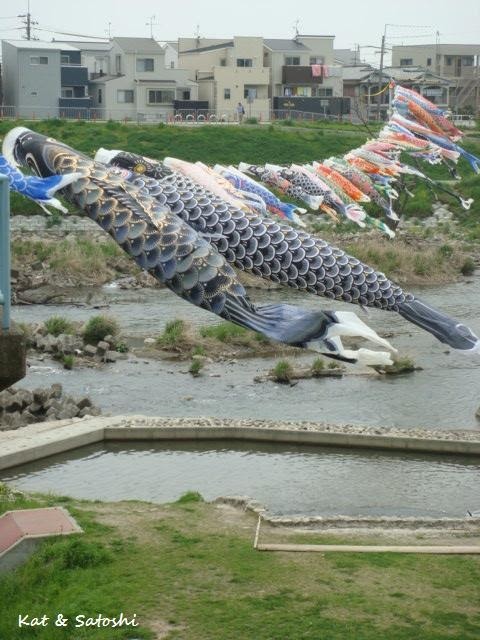 The koinobori display this year is larger than before, there are two lines of fish spanning the river, as well as large bamboo poles with some koinobori flying from them along the banks. The weather has been sunny but there is that awful dust cloud from China that is polluting the skies during this time of year. 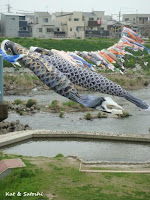 I also shot a short video which you may be interested in seeing of the koinobori, here. 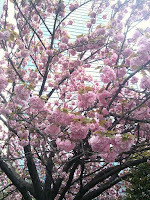 It's Friday here, and the start of Golden Week, hope you have a great weekend. 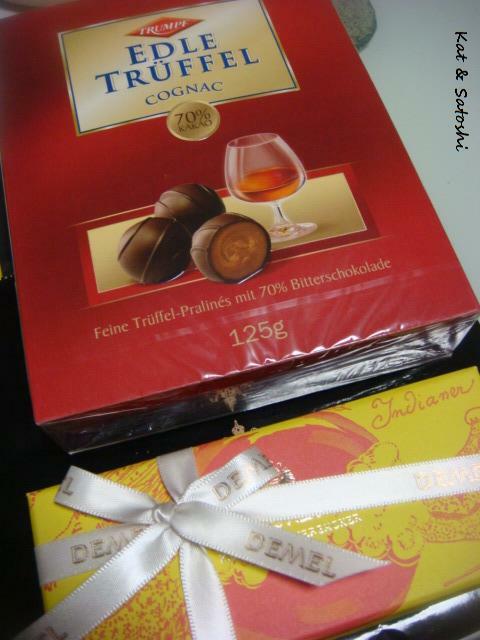 Got these chocolate from Satoshi for White Day before I left for Hawaii. Since I don't really care for chocolates with liqueur in them, I told Satoshi he could eat the ones with cognac in them. 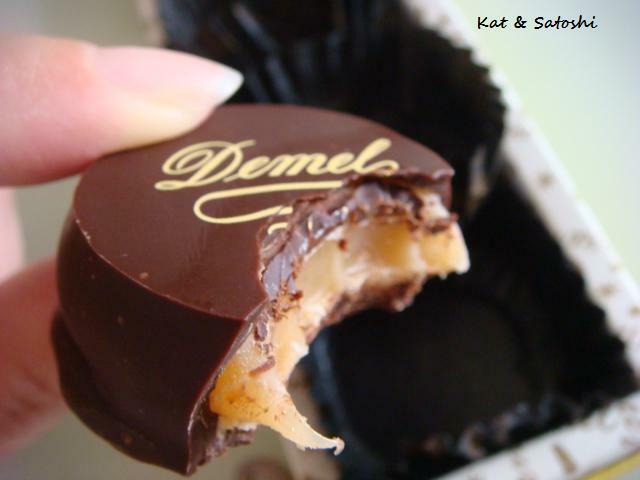 I saved the ones from Demel and had them the other day. It was a box with 3 bon-bons. 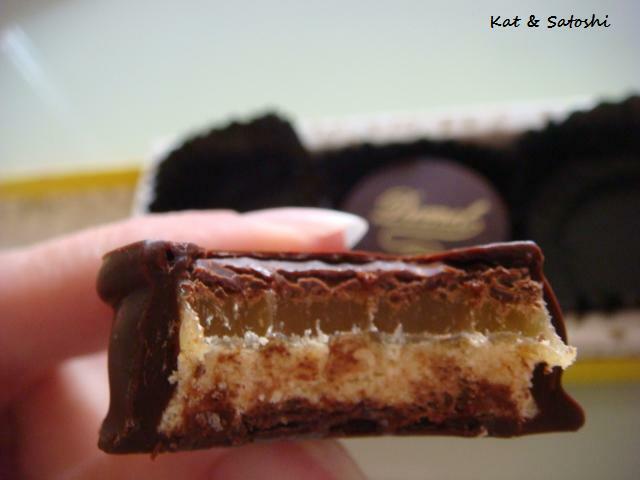 A raspberry caramel, a plain caramel and an apricot caramel. Besides the caramel, each also had a cookie in the center and all were covered with dark chocolate. Yesterday was rather...hot (24C = 75F), though I have to be thankful that it wasn't humid. Somehow I had zucchini fritters on my brain, probably because I was trying to think of ways to use up the carrot ginger dressing. I zapped the zucchini in the food processor and then minced the onion by hand. In a heated non-stick pan, I added some oil (maybe about 2 tablespoons) and fried the fritters. Afterwards, I drained them on a paper towel. NOTES: this was good, I served them alongside with some baby greens and cherry tomatoes. I also stir-fried some eringi and red bell peppers then drizzled some of the carrot ginger dressing. 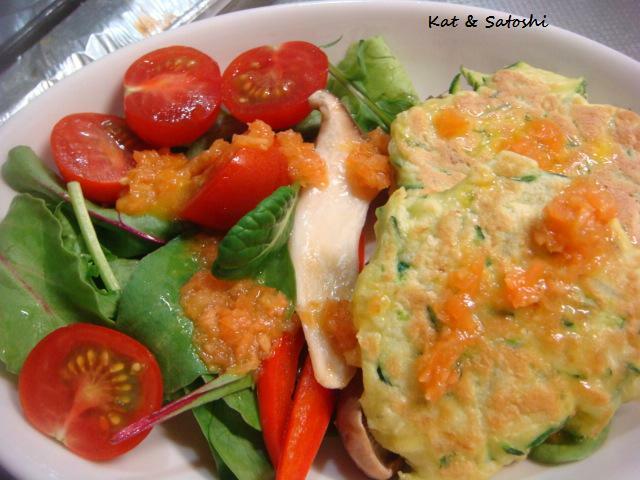 I think these fritters would be perfect in a bento (boxed meal) or even as a sandwich. The weather dude says our temps will go up even higher today...oh boy! Hope your week is going well. 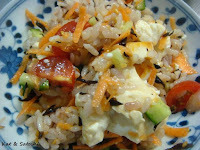 Remember the Hijiki Rice salad? Well, I forgot to mention that the recipe also said the dressing is good on salad greens and/or steamed veggies. 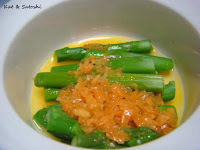 We had steamed asparagus last night, so I topped it with a spoonful of dressing. As you can see, my dressing wasn't smooth, but it was still tasty. 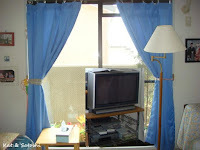 Having been gone from Japan for about a month, many changes occurred, some food places shut down, while new ones opened. Some markets got renovated and houses got built. On top of that, the weather has been weird, at first it was summery-ish and now, brr, wintry, rainy...dreary if you ask me. On Saturday, we tried a new place for lunch before Satoshi's German language class called Mar Ten. 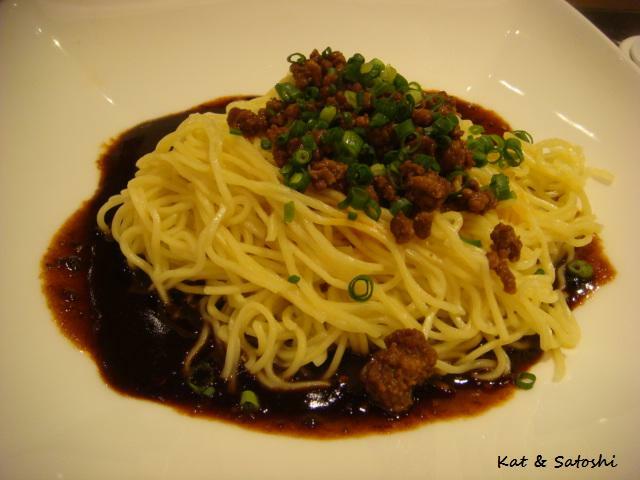 This shop specializes in Mabo Tofu and other spicy dishes. 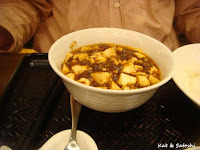 Satoshi tried their mabo tofu set, which came with a cup of consomme, some tsa tsai (chinese pickles) and lots of rice. He chose the least spicy of the three levels and said it was quite spicy for him. Luckily, they offer a free refill of rice. The guy sitting at the table next to us ordered the most spicy version of the mabo tofu and it came out looking almost "black"...eep! I tried their dan dan men (tan tan men). Most times you see this dish in a red soup, but this version was soup-less. After it arrived at the table, the waitress told me to quickly mix it with the sauce below or risk the noodles getting hard. It was spicy and the noodles chewy. I really enjoyed this dish. There was an icy mango dessert that we were also eyeing, so we'll definitely be back. Today is Earth Day. Thought I'd share an Instagram I shot of a double cherry tree that I saw in Umeda. And one I took of the same tree with my iPhone. It was kinda neat seeing nature between the sky scrapers. While in Hawaii, I found a new recipe to try while perusing my Mom's cookbook collection. 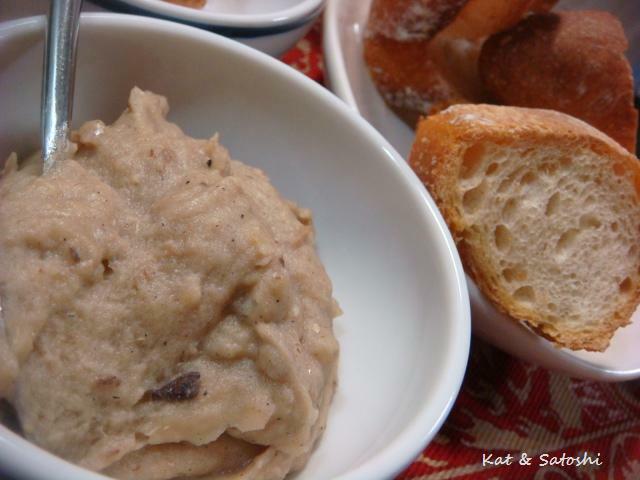 This recipe is a fusion of Asian and Western-style cuisines and comes from the Moosewood Restaurant, a vegetarian restaurant located in New York. I think my Mom said that one of my cousins gave her the cookbook, many many moons ago. There are several parts to this recipe, but it will all be worth it in the end. Drain hijiki, reserving a tablespoon of the soaking liquid for the tofu marinade. Preheat oven to 400F (200C). Prepare a 9x12-inch baking pan with cooking spray or oil. Cut tofu into 4 even slices. Stack the slices and cut down through them 3 times in each direction to yield 64 small cubes. In a bowl large enough to hold the tofu, mix together all of the tofu marinade ingredients. Add the tofu cubes to the bowl and toss lightly, coat evenly with marinade. Transfer tofu to the prepared pan and bake for 25 to 30 minutes, stirring once or twice, until golden brown. Meanwhile, in a large serving bowl, combine the warm rice, with the tomatoes, carrots, onions, cucumber, radish and sesame seeds. 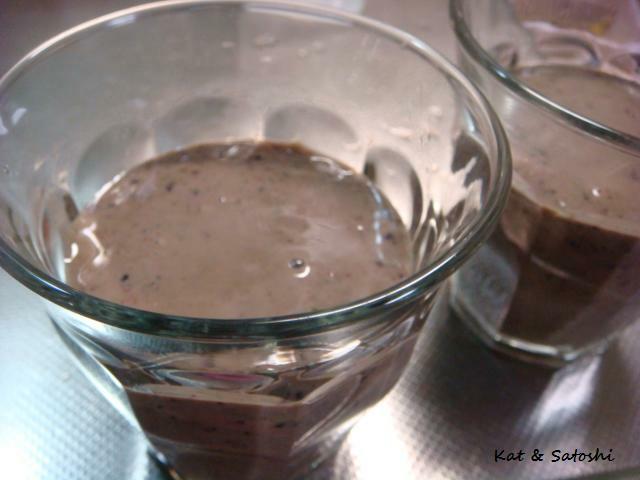 Combine all the ingredients for the dressing in a blender, puree until smooth and set aside. After tofu is baked, remove it from the oven and allow it to cool. Add it to the salad with some of the dressing and toss well. NOTES: I used what hijiki I had in my pantry, this was called me-hijiki and it is a short form of the seaweed. It is also known as hime-hijiki (literally princess seaweed) or kome hijiki (literally rice seaweed, because it looks like grains of rice). I also used 300 grams of tofu which was soft not firm. I didn't have 64 cubes, but 24. I made the full recipe of the marinade but didn't add the soaking water from the hijiki because my tofu was very soft. Instead of using brown rice, I used whatever rice I had in my rice cooker, which was white rice mixed with some kuromai (black rice). I think wheat berries might go nicely in this. Also, I only used 2 full chawan (rice bowl) of rice (about 360 grams). I whizzed the dressing in my food processor and ladled 3 serving-sized spoons of dressing when I tossed it, and added the tofu while it was still warm. I liked this, the flavors weren't overpowering but melded nicely together. I'm glad I found this recipe and think the next time I make this I would also add cooked edamame and/or canned corn. If you try this, tell me what you think. 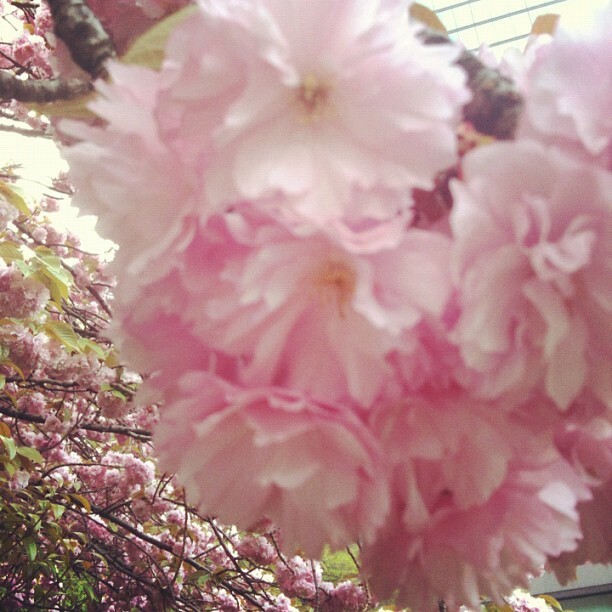 It is the Friday here, the single cherry blossoms have ended but the double ones are in full bloom. The weather is also very warm, almost summery. We had rain, really heavy rain last night. I tried my hand at "green smoothies" for breakfast because I had been seeing it all over the blogosphere as well as on info-mercials. I guess I didn't add enough "green" though, because mine turned a brownish color...I know, not too appetizing looking, but trust me it was delish. I added a handful of baby spinach, 1 small banana, 7 strawberries and a handful of frozen blueberries. I also added a teaspoon of ground flax seed, a teaspoon of almond powder, some water and 1/4 cup of milk. Even if it didn't look "green", I'm planning to experiment some more with this. While I'd rather not go into detail as to why I went, I am glad that I was able to do so and want to thank everyone who emailed and commented their concerns, I really appreciate it. 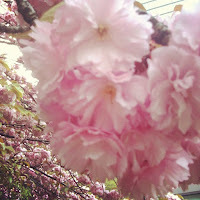 Hope to get back into the blogging groove soon...have to get rid of jet lag too.